What is linear pair of angles? The sum of two angles is 180°. Therefore, linear pair of angles are adjacent angles whose non-common arms are opposite rays. All adjacent angles do not form a linear pair. 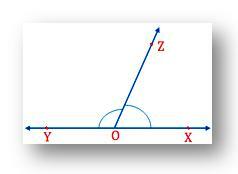 From the above figure we can observe; OX and OY are two opposite rays and ∠XOZ and ∠YOZ are the adjacent angles. Therefore, ∠XOZ and ∠YOZ form a linear pair. If you measure ∠XOZ and ∠YOZ with the help of the protractor, you will find the sum of their measures equal to 180°. Thus, the sum of the angles in a linear pair is 180°. 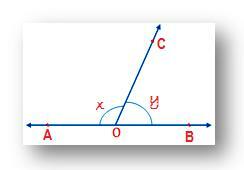 In the given figure, ∠AOC and ∠ BOC form a linear pair if x - y = 60°, find the value of x and y.